Mark ‘Yeti’ Cribb writes, directs and performs comedy for British television including the BBC, ITV, Channel 4, Yorkshire Television, and Paramount Comedy channel. In addition 'Yeti' has performed in shows at The Edinburgh Fringe Festival, and The Big Chill, and wrote a film script for the legendary British comedian Sir Norman Wisdom, but sadly the project was cancelled due to ill health. Click to view extracts. Yeti wrote, directed and acted in over 30 comedy sketches shown on an ITV series called ‘That Prezzie Show’ plus a Christmas Special. These sketches were spoof advertisements for crazy products and services. See video clip above right for some examples. Yeti was personal ideas-man for international star Paul Morocco and his character on the ‘Asylum’ show. Yeti wrote a comic sequence, a number of visual gags and designed comic props. Yeti wrote a sketch about a fictional inventor of Chinese food who in 1900 invents a new type of food called ‘Chinese’ which makes him wealthy. This concept was a huge success on The ‘Little Britain’ show on BBC2, now shown world wide. (Previously, the show’s Matt Lucas was at a publication launch, which contained Yeti’s Chinese Food Sketch, and the rest is history). Yeti wrote, directed and performed sketches, humorous links and a comedy song for a late night show called ‘Flux’ aimed at a student audience. Yeti conceived a new format, presenting style, concept and the term ‘punk comedy' including the inane wearing of own names on t-shirts, and the hilarious special effect idea of superimposing human mouths over toy characters (see Barbarella clip below). Yeti was initially offered his own TV show but instead he became creative advisor for ‘The Adam and Jo Show’ which was based on these ideas. 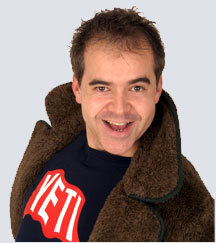 (Adam had appeared with Yeti on a previous Channel 4 series). CALL US NOW ON 01273 73 00 00 TO FIND OUT WHAT WE CAN DO FOR YOU!